This tapered cotton drum 41cm floor lamp shade is offered in a choice of twenty-two colours. Hard lined and fitted with a 10cm duplex ring that requires a shade carrier. A suitable shade carrier can be found by following this link to our Lighting Accessories section. 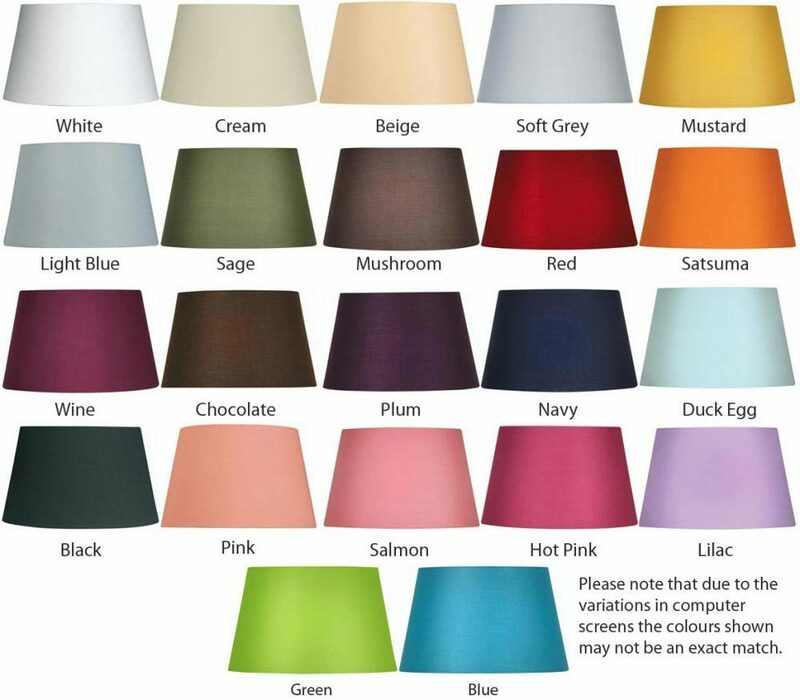 Part of our budget range of lamp shades, available in a choice of pastel, classic and contemporary colours to complement your décor. A 16″ floor lamp shade that is suitable for floor lamps or large table lamp only. At the checkout stage, there is a box below your name and address where you can add any delivery instructions, or as in this case, specify your choice of shade colour. Is the shade measured from top to bottom, plus what is the maximum bulb wattage I can use on the largest shade. The height of these shades, which is 250mm, is the height from the top to the bottom. The 41cm measurement is the diameter at the widest part.The maximum bulb you can use is stated at 100w, but as these are no longer manufactured, we can safely advise that any low energy or LED bulb will be fine as they emit very little heat.